Databases are very much like wine, cheese and trees: they get better as they age. Amazon Aurora exists since 2015. The word aurora comes Latin, means dawn. The name was borne by the Roman mythological goddess of dawn and by the princess in the fairy tale Sleeping Beauty. 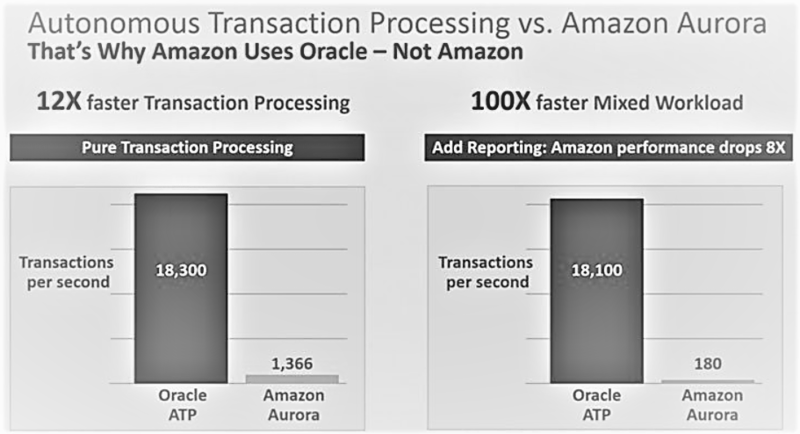 Both Amazon’s “dawn” Aurora and Oracle’s ATP are typical cloud OLTP systems. The question is: what are their differences, which one is better and meant exactly for my needs? Amazon’s Aurora has 2 flavors: Amazon Aurora MySQL and Amazon Aurora PostgreSQL. Amazon Aurora MySQL is compatible with MySQL 5.6 using the InnoDB storage engine. Certain MySQL features like the MyISAM storage engine are not available with Amazon Aurora. Amazon Aurora PostgreSQL is compatible with PostgreSQL 9.6. The storage layer is virtualized and sits on a proprietary virtualized storage system backed up by SSD. And you pay $0.20 per 1 million IO requests. Oracle’s Autonomous database comes also in 2 flavors: Oracle ADW and Oracle ATP. 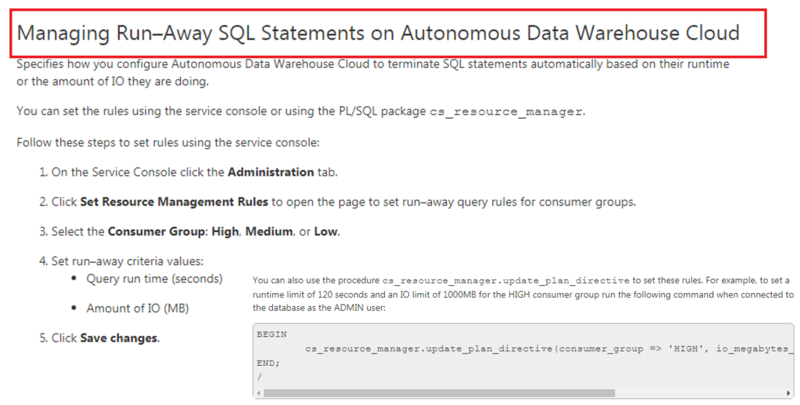 Check Franck Pachot’s article ATP vs ADW – the Autonomous Database lockdown profiles to see the differences of both cloud databases. In general, one can compare Oracle ADW with Amazon Redshift and Oracle ATP with Amazon Aurora. One way to compare is to look at the ranking provided by DB-Engines: Amazon Aurora vs. Oracle. No-brainer who the leader is: score of 1300 vs score of 5 in favor of Oracle. Another interesting comparison comes from Amalgam Insights. Check how Oracle Autonomous Transaction Processing lowers barriers to entry for data-driven business. Check out the DBA labor cost involved: 5 times less in favor of Oracle ATP compared to Amazon! All the routine DBA tasks have been totally eliminated. 1. It really is hard to get off an established database, even one that can be as expensive as Oracle can turn out to be. 2. Some of the very largest workloads will not go to the public cloud anytime soon. Maybe never which in internet years is after 2030. As a kind of proof of how reliable and fast Oracle’s Autonomous Transaction Processing database is consider the following OLTP workload running non-stop in a balanced way without any major spikes and without a single queued statement! No human labor, no human error, and no manual performance tuning! “Big Data wins games but Data Warehousing wins championships” says Michael Jordan. Data Scientists create the algorithm, but as Todd Goldman says, if there is no data engineer to put it into production for use by the business, does it have any value? If you google for Amazon Redshift vs Oracle, you will find lots of articles on how to migrate Oracle to Redshift. Is it worth it? Perhaps in some cases before Oracle Autonomous Data Warehouse Cloud existed. Now, things look quite different. “Oracle Autonomous Data Warehouse processes data 8-14 times faster than AWS Redshift. In addition, Autonomous Data Warehouse Cloud costs 5 to 8x less than AWS Redshift. Oracle performs in an hour what Redshift does in 10 hours.” At least according to Oracle Autonomous Data Warehouse Cloud white paper. And I have nothing but great experiences with ADWC. For the past half an year or so. 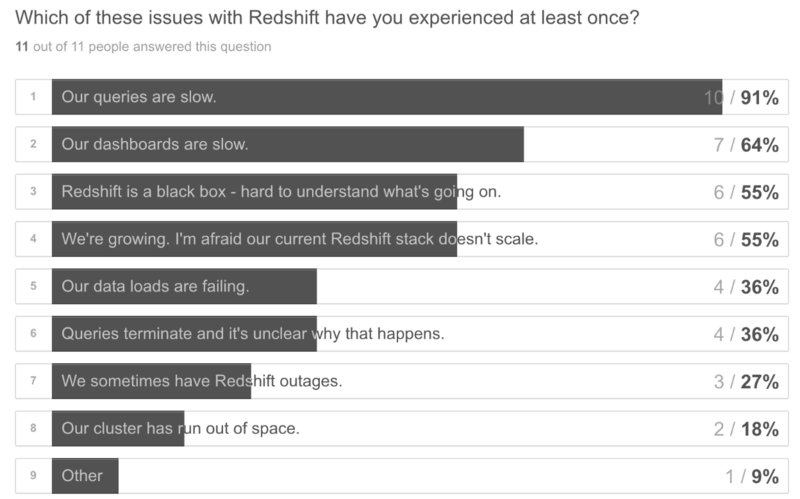 But, what are the major issues and problems reported by Redshift users? Why to migrate from Amazon Redshift to Autonomous Data Warehouse Cloud? 1. Amazon Redshift is ranked 2nd in Cloud Data Warehouse with 14 reviews vs Oracle Exadata which is ranked 1st in Data Warehouse with 55 reviews. The top reviewer of Amazon Redshift writes “It processes petabytes of data and supports many file formats. Restoring huge snapshots takes too long”. 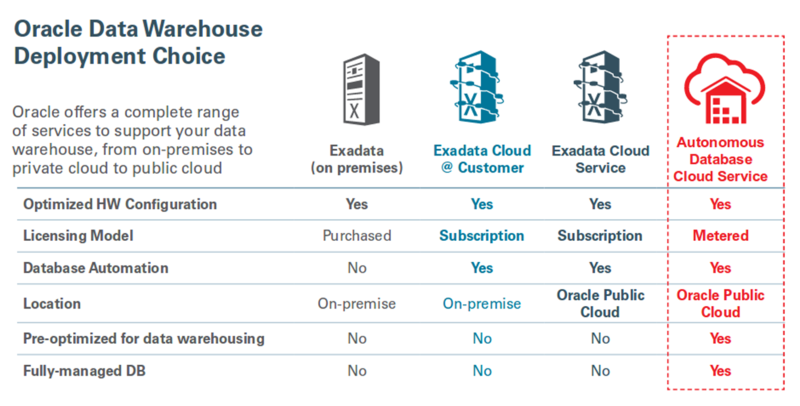 The top reviewer of Oracle Exadata writes “Thanks to smart scans, the amount of data transferred from storage to database nodes significantly decreases”. DB-engines shows an excellent system properties comparison of Amazon Redshift vs. Oracle. 3. Amazon Redshift has several limitation: Limits in Amazon Redshift. On the other hand, you can hardly find a database feature not yet implemented by Oracle. 4. But the most important reason why to migrate to ADWC is that the Oracle Autonomous Database Cloud offers total automation based on machine learning and eliminates human labor, human error, and manual tuning. How to migrate from Amazon Redshift to Autonomous Data Warehouse Cloud? 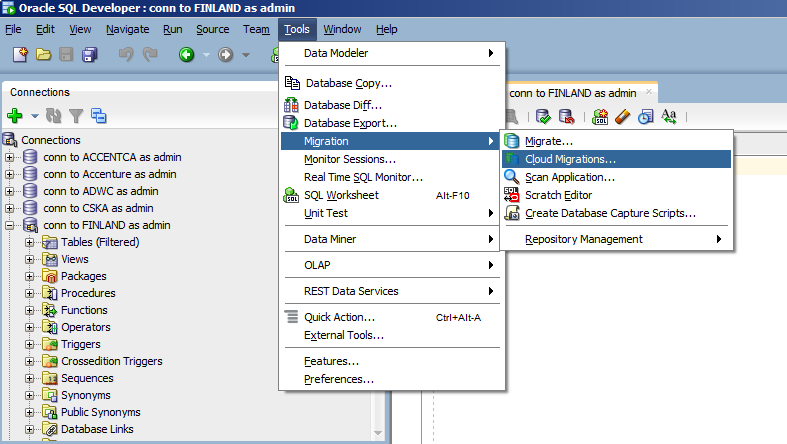 Use the SQL Developer Amazon Redshift Migration Assistant which is available with SQL Developer 17.4. 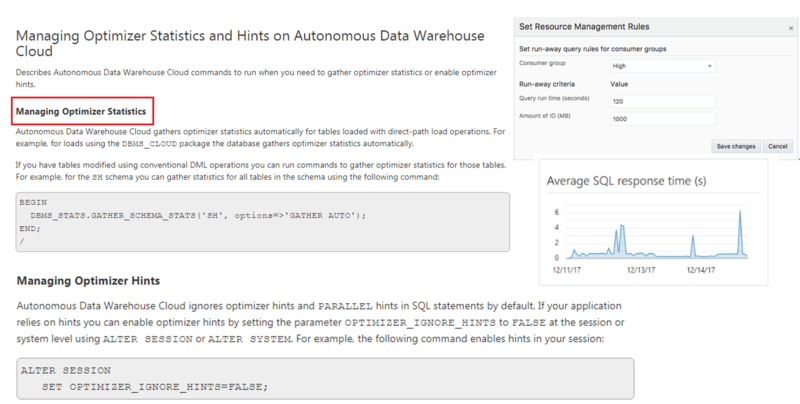 It provides easy migration of Amazon Redshift environments on a per-schema basis. Check out what Paul Way says about why Oracle thinks Autonomous IT can ultimately win the Cloud War. Finally, here is what Amazon CTO Werner Vogels is saying: Our cloud offers any database you need. And I agree with him that a one size fits all database doesn’t fit anyone. But mission and business critical enterprise systems with huge requirements and resource needs deserve only the best. Top 5 Industry Early Adopters Of Autonomous Systems are: (1) Information Technology: Oracle’s Autonomous Data Warehouse Cloud, (2) Automotive, (3) Manufacturing, (4) Retail and (5) Healthcare. Being an early adopter of ADWC, I must say that it is probably the best product created by Oracle Corporation. For sure part of Top Five. This month (May 2018), ComputerWeekly published an article quoting Oracle CEO Mark Hurd that the long-term future of database administrators could be at risk if every enterprise adopts the Oracle 18c autonomous database. So where does that leave Oracle DBAs around the world? Possibly in the unemployment queue, at least according to Hurd. “There are hundreds of thousands of DBAs managing Oracle databases. 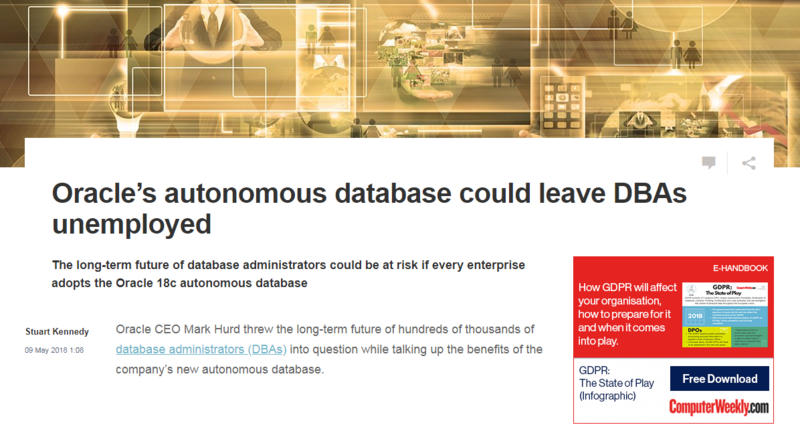 If all of that moved to the autonomous database, the number would change to zero,” Hurd said at an Oracle media event in Redwood Shores, California. 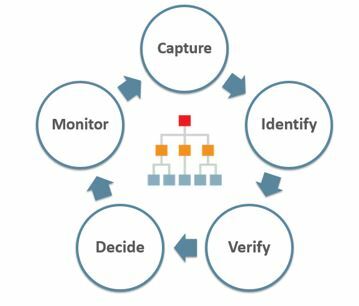 Don’t Fall For The “Autonomous Database” Distraction by Greg McStravick: a totally different point of view on autonomous databases. 1. Who will be creating external tables using the DBMS_CLOUD package? 2. Who will run “alter database property set.. ” in order to create credentials for the Oracle Cloud Infrastructure? 3. Who will restore and recover the database in case of any type of failure? Or failures never happen, right? 4. Who will manage run away SQL with cs_resource_manager and run “alter system kill session”? 5. Who will manage the CBO statistics and add hints? So still: a database without a DBA is like a tree without roots. P.S. Check out the book Human + Machine: Reimagining Work in the Age of AI by Paul R. Daugherty and H. James (Jim) Wilson.